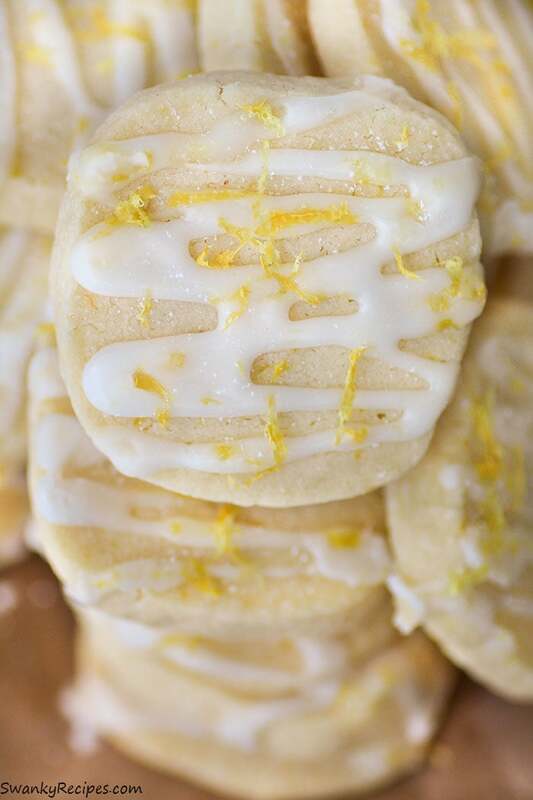 Melt in your mouth lemon shortbread cookies with the perfect amount of fresh lemon zest and an icing glaze with more citrus. 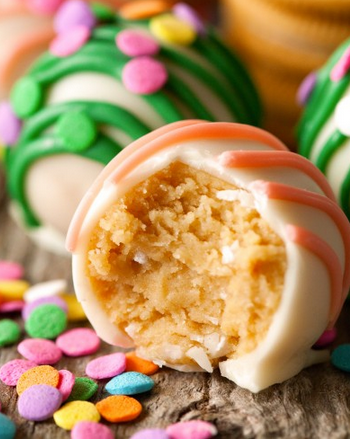 These cookies are delightful and will quickly become a favorite! Cookies are my all time favorite dessert in the world. I don’t think this is a shock to anyone. There is something comforting about being in the kitchen with the mixer going and flour dusting my face. To me, cookies are such a fun dessert to make. They may be the easiest thing to bake, too but I’ve had my fair share of complete cookie fails. Shortbread cookies however, are my weakness. It’s always this time of year in which I like to make shortbread cookies. Since citrus fruit is in season right now, I’ve zested a bunch of fresh lemons to add to the batter. All together, three lemons were used and while that may seem like a lot, it totally makes sense and tastes delightful! What I love about these cookies is that they use few ingredients. The dough is easy to make and the cookies don’t spread in the oven. The Reynolds Cookie Baking Sheets are pre-cut and fit a 12 in. x 16 in. cookie sheet. It’s as simple as removing it from the box, unfolding and placing on the baking sheet. The sheets are non stick and oven safe up to 420 degrees F. They lay flat with no curling, which is a huge plus in my book! These sheets were used for both baking the cookies and as a work station for icing the cookies. 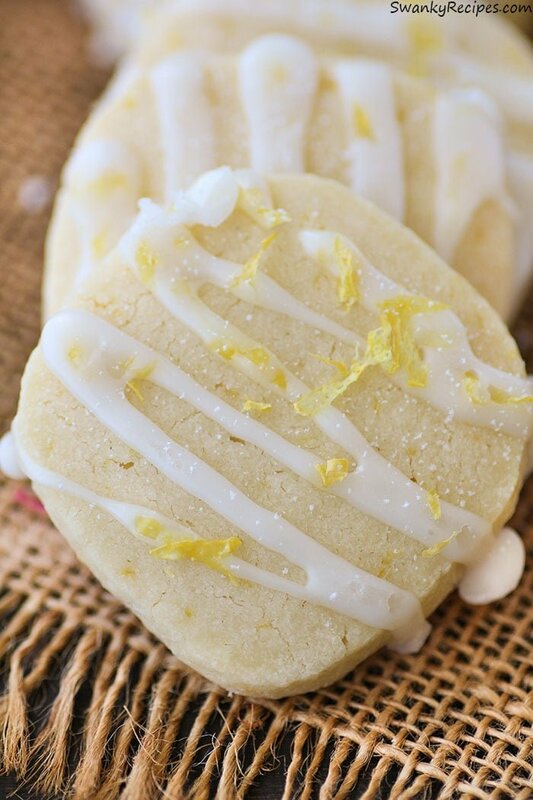 If you are a true lemon lover, you will love this reinvented Lemon Shortbread Cookie recipe. The cookie is a basic shortbread crust. To keep the cookie from spreading in the oven, we’ve replaced granulated sugar with powdered sugar. Whatever thickness the cookie is cut to, it will remain it’s shape while baking in the oven. The top of the cookie has a silky smooth icing. This totally makes the cookie. The lemon zest on top also adds more flavor. 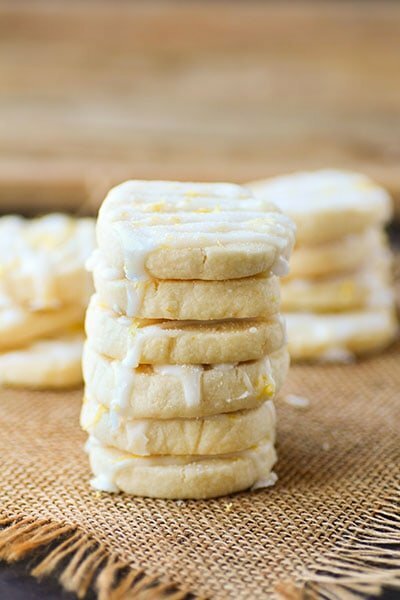 Shortbread Cookies are a classic dessert no matter what age or occasion. I think we can all agree that shortbread cookies are the most beloved cookie of all time and for a good reason. 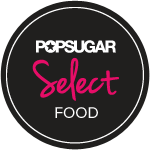 They start with some of the most basic ingredients like flour and sugar and then the dough can be adapted with zest, chips, chocolate, extract flavoring, cherries, dried fruit and so on. A good classic shortbread dough is the most important part however. I love dipping these cookies into a cup of hot chocolate. What are your favorite cookies to enjoy? For more sweet treats from Reynolds, visit here. Follow Reynolds on Pinterest for more delicious recipes. In a medium bowl, sift together the flour, cornstarch and salt; set aside. Wash, dry and zest 2 large lemons or about 1 tablespoon plus 1/2 teaspoon lemon zest. In a bowl fit with a paddle mixer, beat the softened butter and powdered sugar for a few minutes until light and fluffy. Reduce the speed and beat in 2 drops yellow food coloring (for color, if desired), lemon zest vanilla extract. Wipe down the sides of the bowl and the beater then continue to beat until everything is mixed and blended. Slowly add in 1/2 cup dry flour mixture at a time, beating on slow until gone. Turn off blender and wipe down side of the bowl with spatula and gently food everything in then run for 30 seconds on low with the mixer again. Cover top with saran wrap and refrigerate for at least 30 minutes to cool dough. Lay out a long piece of saran wrap. Use a hard spatula to fold dough edges in and gently start forming a long dough roll in your hand then place on saran wrap. Seal saran wrap and roll dough or form it to 10 inches long and about 6 and 3/4 around making sure the ends are patted almost square. Slice cookies; I was able to get about 20 cookies out of the dough. Preheat oven to 350 degrees F. Bake on a prepared cookie sheet lined with Reynolds® Cookie Baking Sheets for 11-13 minutes. Cookies should not spread in oven. Allow to cool on baking sheet for 20 minutes until cool enough to move. To make icing, in a small bowl combine powdered sugar and water then mix to incorporate well. 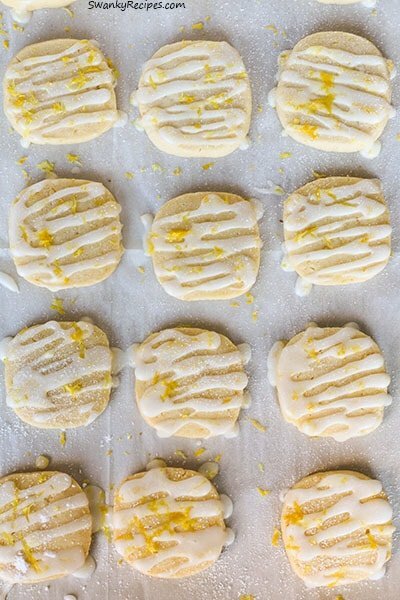 Use a spoon or fill a pastry bag with icing and drizzle over cool cookies. Zest lemon and sprinkle over top for more added flavor, which is amazing! Dust with powdered sugar if desired. Buttery and delicious, yes! 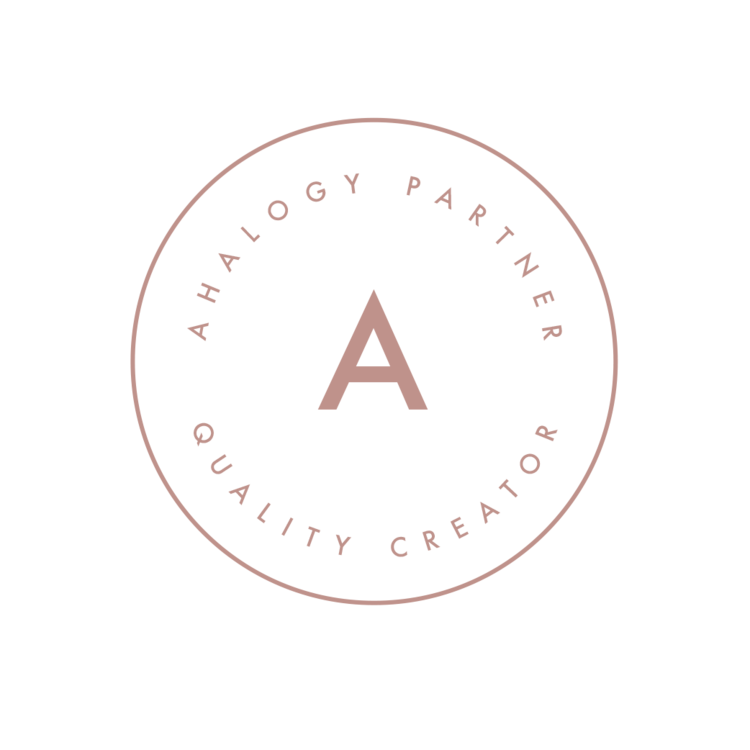 We love theme here! 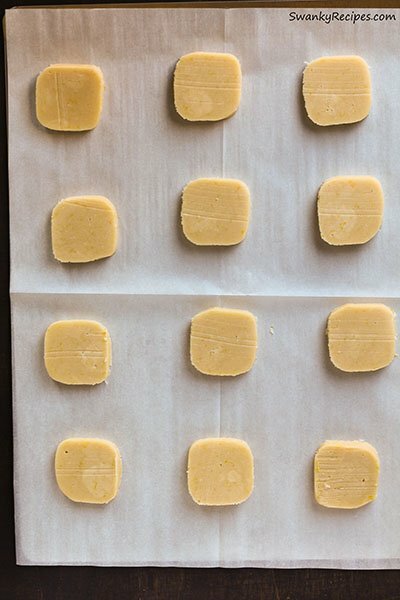 These look delish and love the pre-cut cookie sheets! Theses look delicious. I will pin this recipe for later. These cookies sound so good. I bet these would taste delicious with a cup of tea. A good, classic shortbread is always a nice recipe to have in your cookie arsenal. 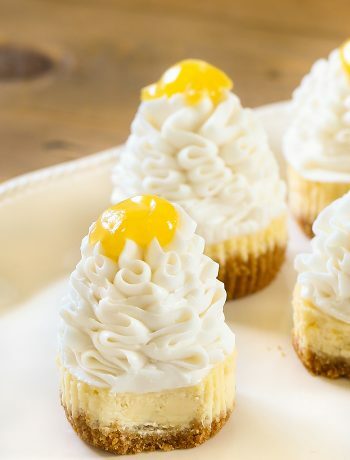 A citrus version sounds delightful and I’d pair these with a steaming cup of Earl Grey tea. So making those cookies. They look so yummy!! These sound so amazing! Lemon is one of my absolute favorite flavors! I could be missing it, but what’s the amount of powdered sugar in the cookies? It just says 1/2. They look delicious and I will definitely be making them soon! Hi Michelle, It’s 1/2 cup, I’ve updated. Thank you! 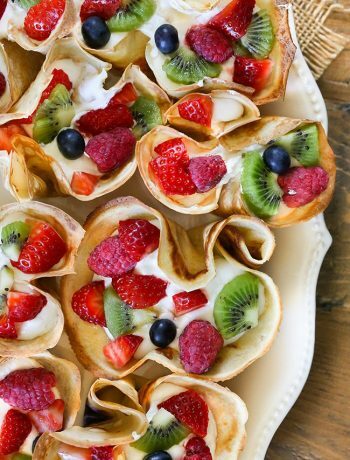 These look soooo good & I totally pinned them so I can make later. 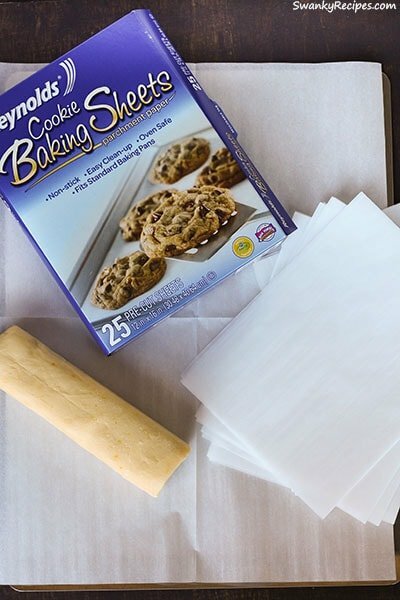 I am constantly baking something & didn’t know Reynolds had these baking sheets – will have to check them out! I absolutely love shortbread! I don’t make it enough…probably because I would forever be eating these delicious cookies. I haven’t ever made them with lemon though, that sounds wonderful! 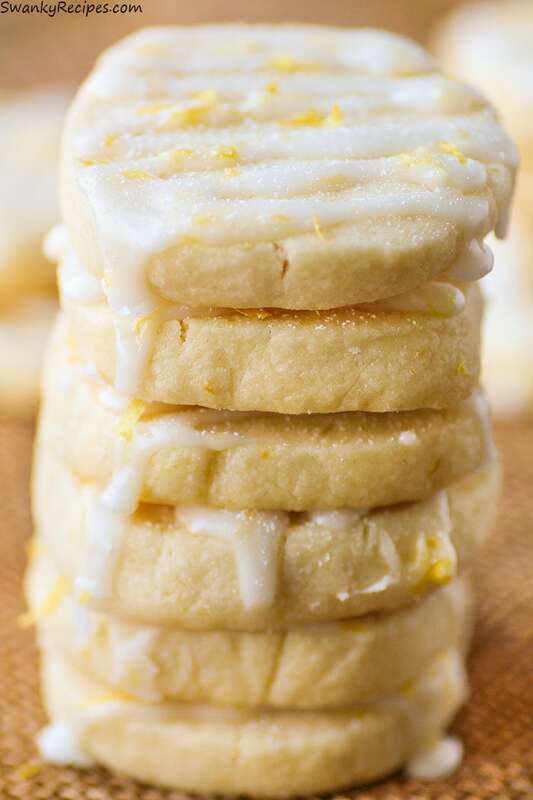 Lemon shortbread cookies awesome. 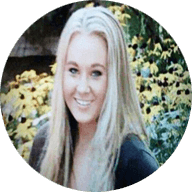 The flavor is one point here, thanks Heather! The cookies look amazing! I can’t wait to try your recipe. This cookies look so fantastic my mouth is watering. 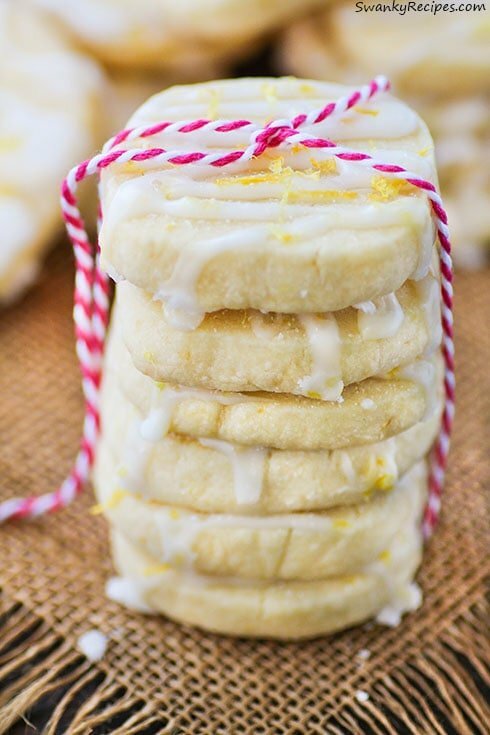 I love lemon and shortbread so I’m definitely pinning this recipe to try later! These cookies look amazing!! I may be overlooking it, but I couldn’t find the temperature to cook them at? Is it 375? Thank you so much!! 350! I’m updating now, sorry! What can I use in place of the lemon extract? Lemon juice? Yes go ahead and add 1/4 teaspoon lemon juice and 1 teaspoon lemon zest or more to the cookies. They are looking adorable. Thank you. Hi, does the icing harden so when you stack the cookies it doesn’t smear on to the bottom of the others? It should harden as long as it dries by sitting out for a bit.